Hello all, I'm not sure how's the accepted way to map three-way junctions, please see the two examples below. In the example above I followed the generally accepted rule of mapping ways as the middle point of the road. 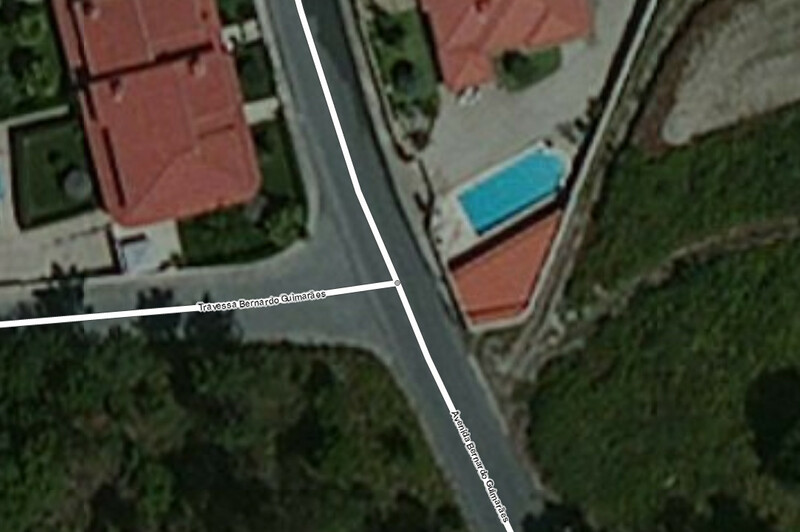 In this example I just connected the road coming from the left to the already existing road that goes vertically. Your question example shows what in Britain is often called a "T" junction with a major road running from the top of the picture to the bottom with a minor or side road ending at the Main road. In general from what I've seen from the imports and official maps from the ordanance survey in the UK (which affects where I normally contribute) the main road traffic runs straight regardless of the other road joining on the side so the routing line runs straight on like in your last example. this shows a big "T" with the white lines showing how the main road passes by straigt (at possibly speeds upto 60MPH). Also shown is the addition of highway areas and the footway (aka pavement/sidewalk) being added. The hedges marking the sightlines are yet to be added. At this detail level confidance in possitional accuracy stretched a lot when relying on arial photos, and ground surveys are important to understand the grainy photos properly. the headges sugest it is a cross-roads with two "T" junctions meeting from both sides with a slight offset. as both roads approch at 90 degrees the routeing line leaves the road area of the main road at 90 degrees. I've left the kink in at the moment to show its the same junction and the routeing lines with fall all crossing the road area of the main carrageway. In this 2nd example has two "T" juctions arriving simaler to the first but in a urban setting and no connection to each other. The priorty and shape of junction is clearly painted on in white lines on the lower junction with the upperon already haveing had Highway areas applied for the footway and main carrageway. both routeing lines approach at same angle as the roads with the main road staying straight. In this example and many other link road joinings and roundabouts the routing line meets the main at an angle but the main stays straight (Or on its own bigger curve in roundabouts). This area was mapped at a larger scale than I normally work these days which is why there is a lot of dissplacement issues and I could have tried for a better alignment too. These " country roundabouts formed when (before traffic laws carrages, waggons and other traffic took the shortest path. so genrally didn't go into the middle of the road space when turning some are big enough to form three forks while others just get converted to other big junction types that reuse the middle. The picture from nevw shows something like what your first evample shows. Sorry this took more than an hour to prepare. If the street coming from north to south ist really straight in real life, then the second image shows the correct mapping technique. Thus, If you encounter some junctions that are mapped like the first image, I would recommend a correction to a straight line. I think your second example gives a much better representation of what is on the ground and also a better guide to how traffic moves through the ways.